You will join the dark side! 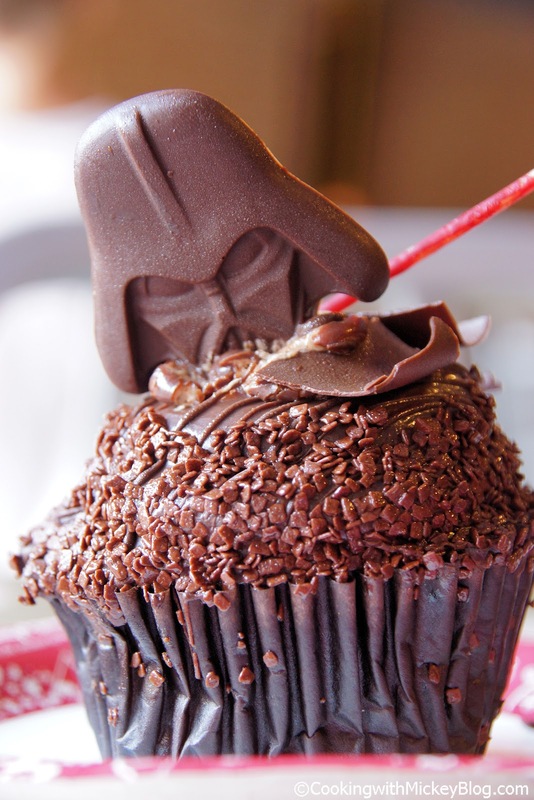 The Darth Vader Chocolate Peanut Butter Cupcake is worth being seduced by the Dark Lord for a day. Available for a limit time during the Star Wars Weekends celebration at Disney's Hollywood Studios is the Darth Vader cupcake. 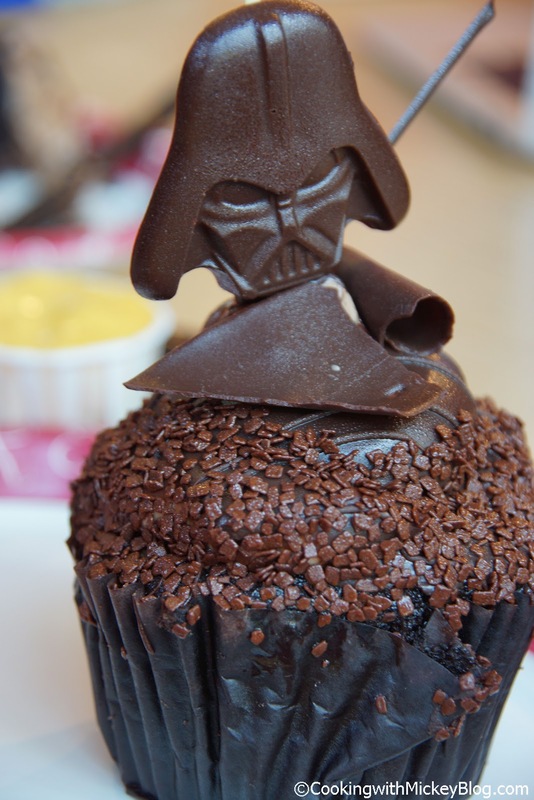 Besides the food court in Darth's Maul, you can pick up the cupcakes at ABC Commissary, Backlot Express, Studio Catering Co., Starring Rolls Cafe, and Toy Story Pizza Planet. Now, I'm someone who likes but doesn't love chocolate and don't care too much for milk chocolate (it's just too sweet and doesn't have enough cocoa flavor), so I was a little hesitant to dig in. 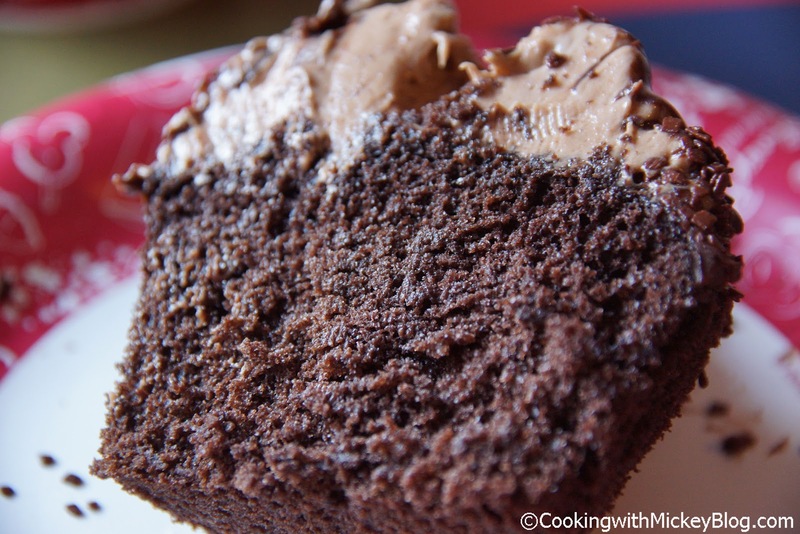 At first glance this cupcake looks like a chocolate lovers dream. But looks can be deceiving! 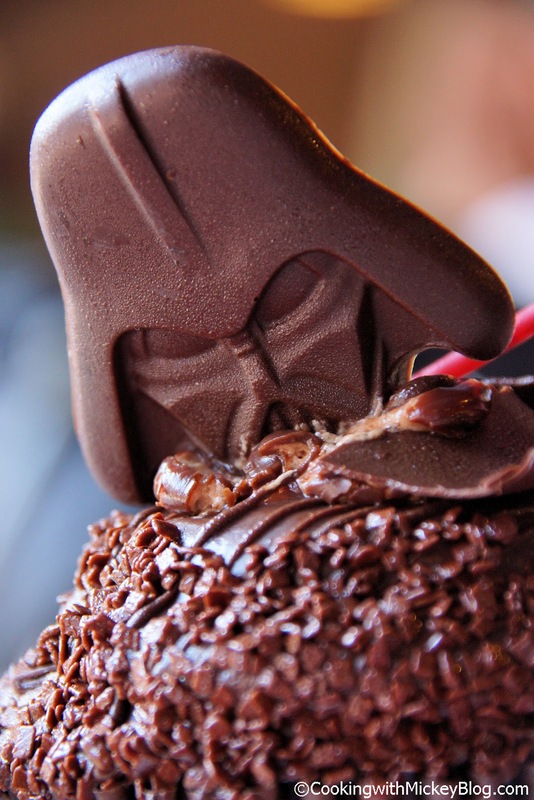 Hidden underneath Darth Vader and the covering of chocolate pieces and shavings is peanut butter icing. I was surprised by the not just the amount of peanut butter frosting but the chocolate was dark chocolate. The cake was moist, which I always start with (I'm a save the best for last kinda girl), but nothing overwhelmingly great. I'm sure you're wondering about the light saber. No it doesn't make sounds and yes it's edible. Made of white chocolate, some of the locations have it painted red while others have it as is. A couple of them where even made of chocolate, but I did find most to be worth of Darth Vader. Overall, I really enjoyed this cupcake. Might even be one of my favorites. 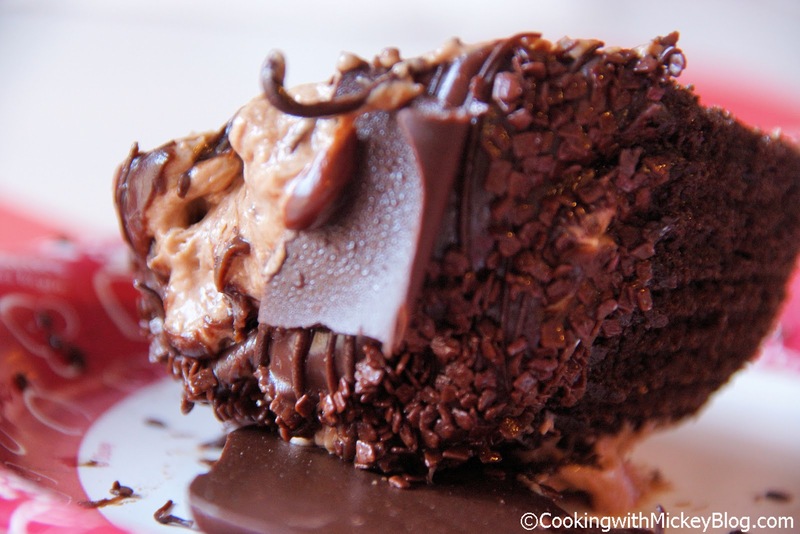 For someone who's favorite dessert isn't cupcakes, this one is fantastic. I even enjoy a second! One little tidbit, if you are on the Disney Dining Plan you can get this for dessert! Will you be visiting Star Wars Weekends and trying out this cupcake? 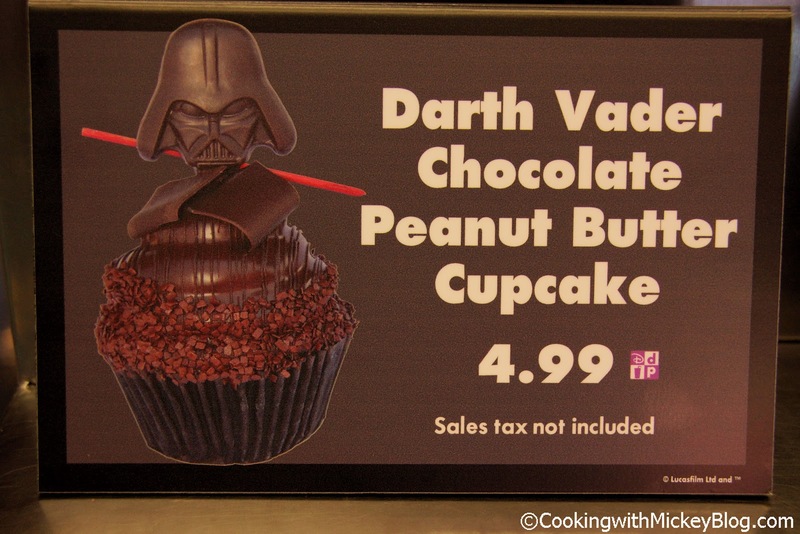 If so, let up know what you think of this limited time cupcake.